Rhythm of the Night is a top down, 2D rhythm based puzzle game. You play the role of a thief sneaking through a museum at night, trying to steal a priceless artifact known as the Quartz Heart. The Quartz Heart emits a powerful beat making everything, including you, move to it's thrall. Sneak your way past guards and lasers and through twisty museum halls in order to steal the heart and get a good nights sleep. 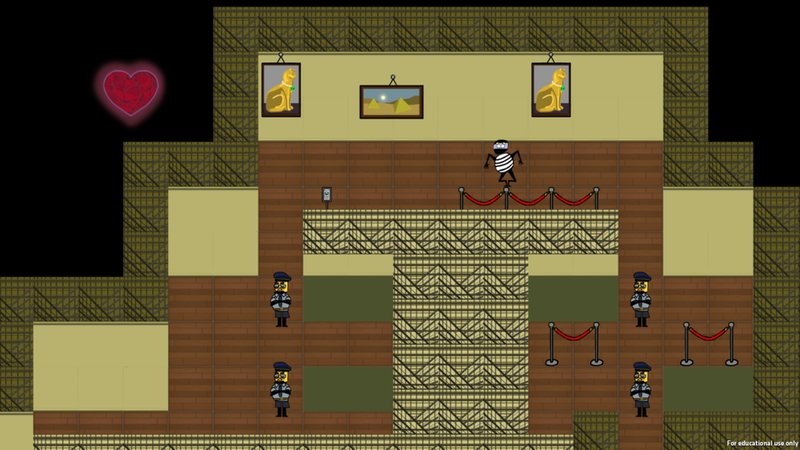 Created over the span of a semester, Rhythm of the Night was an attempt to blend fast paced rhythm gameplay, with the slow, methodical gameplay of a stealth game, out of a personal desire to make a stealth game I'd want to play. Rhythm of the Night has a dynamic music system. Each level component from the pulsating heart, guards walking around, and lasers turning on and off. Audio clips duck in and out of the mix based on the player's position in the level, giving the player a auditory clue to upcoming enemies, as well as building a cohesive song. A "mixed down" version of the song can be heard in the gameplay trailer. Rhythm of the Night was conceived as a pure deconstruction of the stealth genre. As someone who likes exploratory and systems based games, I should like stealth games, but very few appeal to me. I find the waiting for the enemy AI or camera to swing around dull and plodding. I wanted to combine a game that naturally has a sense of forward progression or rhythm to make a more action based stealth game that appealed to people like me: someone who really wants to like a type of game, but just can't get past the pacing. After some conceptualization, I came up with the concept of blending a rhythm game with the traditional elements of a stealth game. Dropping pure stealth gameplay for a more refined "puzzle like" approach, where each level has a rhythm and a path you can worm your way through without stopping... or you could take your time, and move when you are ready. Level design was a rapid, iterative process due to a quick tile snapping tool created by programmer Dan Covert, and easy guard waypoint placement by programmer Garret Moran. I would test out geometry, and place guards, lasers, and obstacles where I thought they might pose a problem, test, and iterate. The final project has 4 levels, each introducing a mechanic and getting progressively harder. Being the sole designer, I was in charge of all aspects of design, from systems, level, and audio design. Programming: Garret Moran & Dan Covert. It is downloadable here for Windows computers only.